Water safety is a huge safety concern especially during the summer months where kids are more exposed to pools, lakes, and the beach. 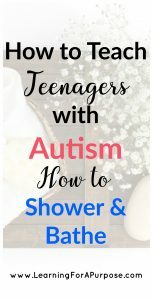 When researching about water safety for kids with autism, I found out that drowning is the leading cause of death for kids with autism. Drowning is such a concern because children with autism can wander off and they may be drawn to water areas. This is why teaching water safety skills are so IMPORTANT!! Water safety skills are important for all children to learn, but this is vital for children with autism in order to help keep them safe. *This post contains affiliate links. Please see our disclosure policy for further details. Swimming lessons are a must to help children learn to be safe around the water. Try to find swim instructors and programs that offer swim lessons specifically for children with autism. The National Autism Association offers a comprehensive list by city and state of YMCA’s that offer swim lessons for children with special needs. Help them ease into the swimming program by letting them take a tour of the pool/environment before the lessons. Let them explore the area and get used to the sights, smells, and sounds that they may encounter. Create a positive atmosphere by talking about the pool and how fun the experience will be for the child. Find a way to introduce the water to the child before the lessons begin. 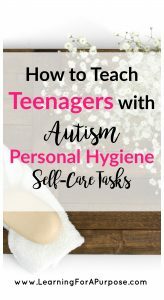 This could be by letting them watch videos of swimming lessons on YouTube, introduce water play with toys during bath time, or get a mini pool with very shallow water and let them play in there. If the child is super fearful of the water, they may need an extended amount of time to desensitize to the water. If the child cannot swim, try to find a swim vest or flotation device that child can wear to help keep them safe. Teach the skills in a way that the child will understand. Try to create an atmosphere with minimal distractions and repeat the concepts as often as necessary for the child to understand. Be patient. Try using a visual schedule during a swimming lesson to help them understand what they will be learning and help with transitions between the activities. This can also help to ease anxiety and frustration to help make a more successful swimming lesson. Try taking pictures of the actual pool environment to help them better understand the environment and to help with transitions. 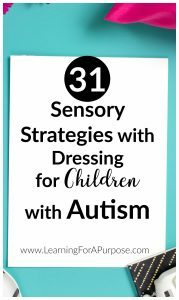 Create a sensory-friendly environment for the child. Do they need to wear a specific type of swimsuit, wear goggles, ear plugs, or nose plugs? Check out the KU Sensory Enhanced Aquatics program with a video showing how to help make teaching water skills for children with autism successful! Pool Safely has some great tools and videos to help explain water safety for children. Austrailia’s Royal Life Saving Society has created a kids zone dedicated to teaching kids about water safety in fun interactive ways! Kickboards: these can help your child stay afloat while they practice kicking their legs. Goggles: these can be helpful if your child is bothered by getting water in their eyes. Ear protection: These can be helpful to help keep water from getting into the ears, but also to help minimize the sound. Water Noodles: Noodles are another fun way to use a flotation device to help child float and learn to kick their legs. Set up the environment for success by putting bells, chimes on doors to help let you know if they open. Put locks on doors and put high chain link locks as well out of reach of kids. Secure the pool area with a fence, cover, and alarms. Install a fence/gate with an alarm around a home pool. 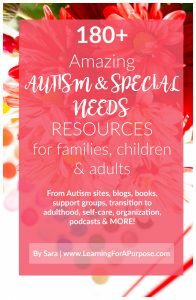 Let your neighbors know you are worried about your child wandering and that your child has autism. Encourage them to always keep their pool fence secured and aks if you can contact them if your child ever wanders. Always stay near your child when around the water. Do not let them out of your sight. An accident can happen super quick, and you can be right there to help stop it from happening. Teach your child about the dangers of water. Talk to them about water safety through a social story or social video. 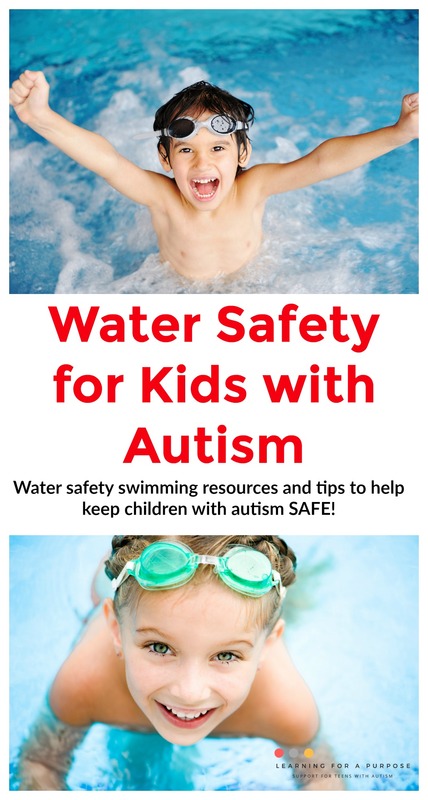 The National Autism Association provides a comprehensive safety guide with the Big Red Safety Toolkit for parents to help keep them safe around water. We hope you find these water safety tips and reousces helpful for you and your loved one. We want to make the water safe for all children! Let us know if you have any more safety tips you would like us to add!